I think its short term oversold conditions are going to get even more oversold. 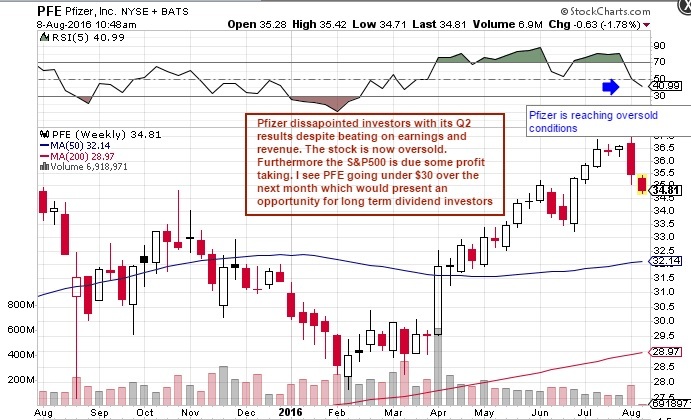 The S&P500 needs to burn off elevated sentiment so Pfizer (NYSE:PFE) could get caught in the downswing. Long term fundamentals are still strong with this stock though despite poor prevnar sales in Q2. Anything under $30 a share would be a good long term buy and hold entry point. This entry was posted in Stock Picks and tagged PFE. Bookmark the permalink.